What is the role of trees on farms? Climate change is real - temperatures have increased by around 1oC in southern Australia. This change is due to humans burning fossil fuels and clearing forests. 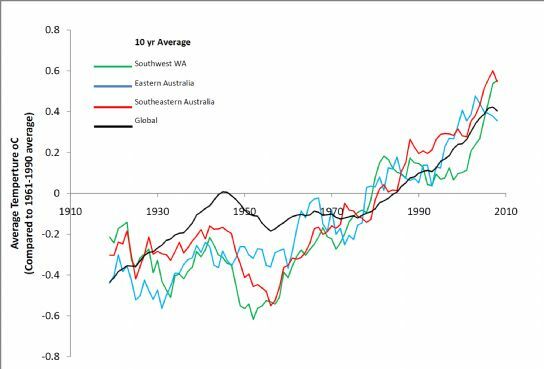 The graph shows the ten year rolling average temperatures over the last 100 years in three major farming regions of Australia (data available from www.bom.gov.au). Both the rate and extent of change in Australia neatly matches the trend in global temperature rises and roughly represents an increase of one degree Celcius over 50 years. Whilst there is some uncertainty about the impact of temperature rises on rainfall and wind speeds the fact remains that increasing temperatures will naturally result in increased number and intensity of extreme evaporation events, shifts in the timing and nature of plant growth and changes in pests and disease dynamics. It will also lead to more extreme fire danger events and possibly more intense cyclones. The temperature increase we have already seen is enough to suggest we need to change the tree species we plant. What worked in the past, including the local indigenous species, may not be right for the future. If the trend continues then who knows what the implications might be for our forests. Not surprisingly, given the emphasis on reducing CO2, almost all talk surrounding the value of planting trees for climate change has been driven by notions of carbon sequestration and trading. Unfortunately, this approach overlooks the immediate value of trees on farms and the role they might play in helping farmers remain viable. I accept that it may be true: if enough forest is planted on cleared land around the world the rate at which the temperatures increase may be slowed. That's fine but the fact is that the climate has already changed so much already suggests that, for most landholders, mitigation of the world's climate probably comes well behind their immediate concerns about adapting to more difficult and uncertain local weather conditions. If we, as a community, can support strategic revegetation of farms in ways that help farming businesses survive and adapt to climate change - without forests displacing valuable farmland, increasing the fire hazard, or using up valuable water resources - then the carbon the trees lock-up would be a bonus. 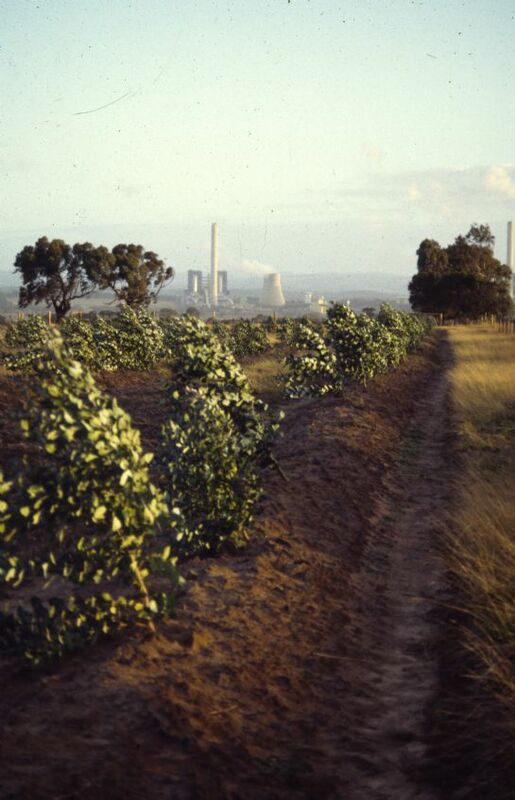 With ten to twenty per cent of every farm requiring revegetation in order to control land degradation and protect productive farming systems it is imperative that farmers are seen as the key to increasing forest cover in Australia. Every tree planted for shade, shelter, timber, food, biodiversity, erosion control and aesthetics locks up carbon. If governments and community groups want trees planted on cleared land for carbon sequestration the best starting point in any discussion with farmers may not be carbon at all but the many other values that make owning these trees worthwhile. 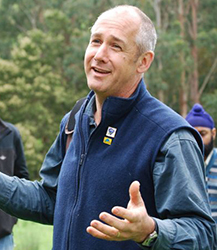 The need for climate amelioration and income diversification will drive revegetation on farms - sequestration is what the community gains by helping landholders achieve these goals. Sequestrationof CO2in living biomass, soils and woody products as a means of offsetting agricultural emissions and providing marketing and partnership opportunities. providing real long term locally secure 'green' jobs that are not dependent on short term government funding.